We love our Mac computer. After several years suffering through viruses and horrid lag times, we purchased a Mac computer in March of 2009. 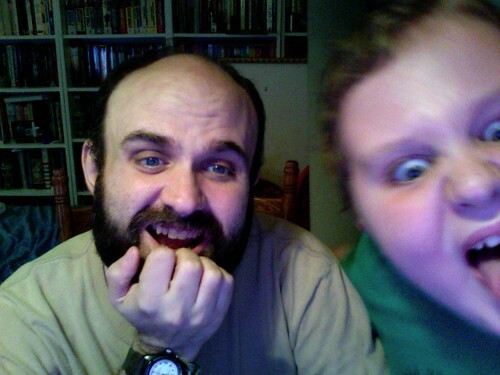 My husband Fred and our son Freddie loved it and immediately tried out the photo booth function. Fred thought it was wonderful. And one of the greatest tragedies of his illness was the fact that he only got to use his new Mac for 14 days before he was hospitalized. For the past two years the Mac has patiently endured constant use by either Freddie or I. And we research arcane topic after arcane topic… and sometimes our topics crash into each other and provide enlightenment for us both. Is “HAI” a Hospital Acquired Infection? Or is it Japanese for yes? Or is it lolcat for hello? Is Portal a video game that was released in 2007? Or is it the preferred method for patient access to the Electronic Health Record? Sometimes the term the IOM report and a reference to its content are used so much in patient safety conversations, that the reference loses the original impact and meaning it had upon it the health community. 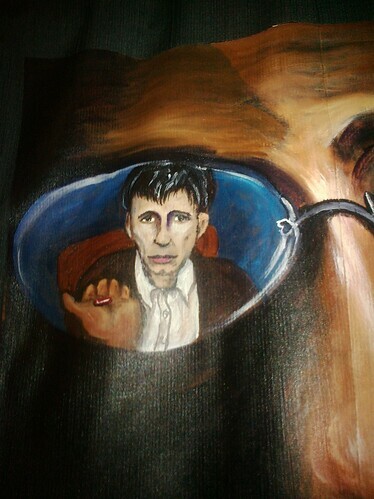 I explained the content of the report to my 12-year-old Freddie and he decided to be a Walker in The Walking Gallery. Freddie decided to stir things up a bit. He thought there was a perfect pop culture analogy to the IOM Report. Freddie thought this would be a powerful statement. 98,000 names, 98,000 people dying every year from preventable medical errors, and are people marching in the street about it? No. It has become an old and well-worm meme in the world of patient advocacy. Say “over 9000,” or any other arbitrary high number, in reference to medical error and death, and watch eyes glaze over and minds refuse to comprehend the level of tragedy. This is why the individual story is so important. I can speak of my Fred, Valarie Barnes can speak of her Justin, and Ted Smith can speak of his Mother. Those single stories can help people to self identify. Freddie can speak of a fictional character like Light and explain the anguish a character feels when death is only a name away. Sometimes he won’t even have to speak. 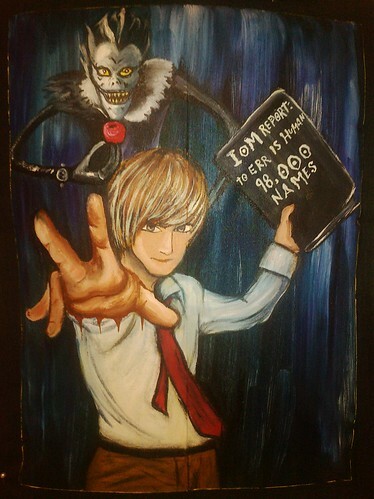 He can just walk by, and a Death Note fan will understand the powerful danger of being a name in that book. David Hale saw this jacket a week ago. His mouth dropped open and his eyes opened wide. This jacket was geeky chic, powerful and cool. And that combination can affect people. Do old memes really matter? I think they do. I think there are a lot of Mom’s who are still discovering dramatic chipmunk or finding out about the dangers of MRSA. Last night, Freddie was looking up another old meme: “Chuck Norris” and this is the result of that Google search. We had just been “Rick Rolled” by Google. We laughed again. Freddie and I both agreed we love Google. We love that that they play with the form and recognize the power of memes. I also love that when the health staff at Google realized people were using their search engine to find the number for poison control during an emergency, they changed their search page. 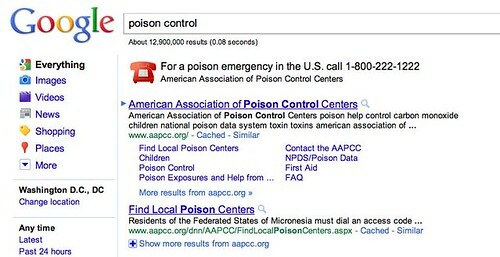 They placed the 1-800 number for poison control first on the landing page, not buried within the search results. They did so with a striking visual: a red emergency phone icon. I hope Freddie can do the same for the IOM report during The Walking Gallery. I hope he can be that striking visual that redirects the searcher to the right information, and in so doing, saves lives. 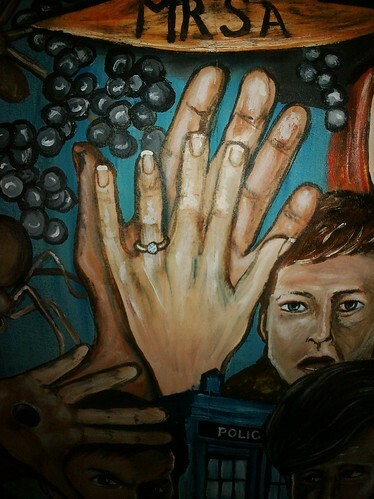 I must admit when I am working on paintings for The Walking Gallery I am usually listening the NPR at the same time. Yesterday, I laughed aloud during “Wait, Wait Don’t Tell Me.” The entire radio team was disparaging the game Candy Land and warning listeners about its seemingly endless path. But sometimes in life and play the deck is stacked against you. 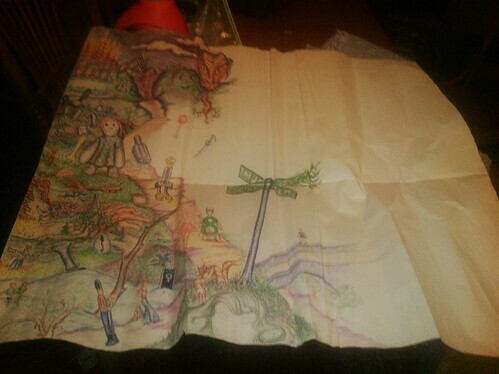 And you might not know this about Candy Land, but it was designed by someone recovering from polio. She wanted a game appropriate for sick children. 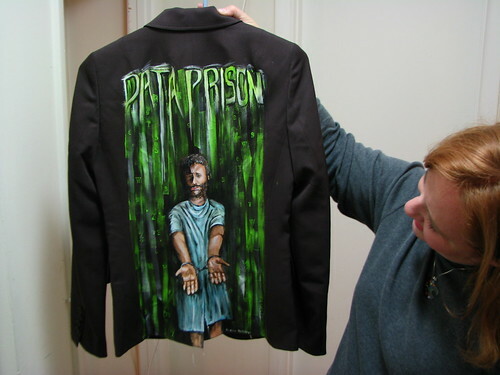 This is Valerie’s jacket: Hospital Land. This is about a Valarie’s life as parent and chronic caregiver. This about a child named Justin who cannot speak and has suffered through thousands of seizures in his short life. This is about the endless game they have played for years. 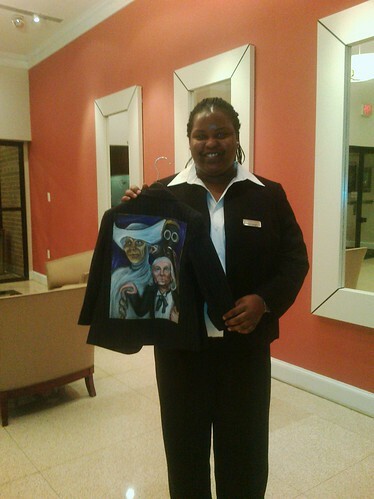 Valarie Barnes works as a concierge at the 24-hour front desk in my Apartment Building. My building is an Archstone Smith property. 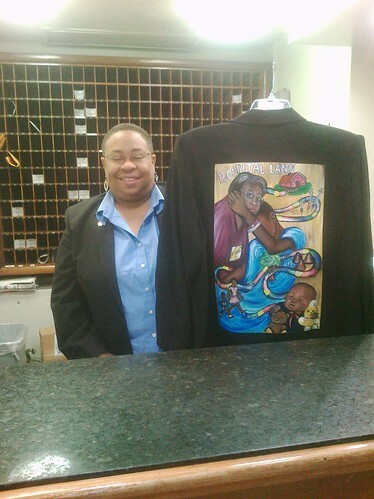 The front desk staff dresses in nice black blazer or jackets. They are very kind and considerate. They place a coffee service in our lobby every day of the workweek and often make fresh baked cookies. They patiently answer the same repetitive questions. Each day they log our UPS packages and send us emails to remind us to pick up those packages. They work very hard and in the spring of 2009, our family tragedy made their job harder. When Fred was hospitalized, large numbers of the Chevy Chase community offered to help by providing cooked meals and groceries. Two of the customers from the toy store who had become my friends offered to organize the outpouring of assistance. Those wonderful ladies were Janet Zwick and Chris Berg, they created a page on Lotsa Helping Hands. That site helps coordinate the help of large groups during tragedies like ours. Everyday some one would drop a home cooked meal to our front desk. Once a week someone would drop a week worth of groceries at our front desk. The staff would rearrange the contents of their fridge to accommodate the many bags. They did this politely without complaint and would wait for my return from the hospital. I after I would get home late at night. I would re-heat the meals and make a plate for my mother-in-law Joan, my two sons. And as a thank you I would fill another dish for who ever was working the front desk. I would thank the staff again for their kind assistance and they would ask after Mr. Holliday. And I would tell them of the frustrations we were dealing with. Through all of these conversations, I met Valerie. As I shared my dismay at the poor care my husband was receiving. She told me about their medical journey and about her son Justin. And in the spring of 2009, our medical story affected Justin’s path in Hospital Land. Each day I would tell Valarie about our spiraling downward care in the hospital. Frequently I would tell her not seek care at the hospital Fred was admitted to. If somehow they ended up there make sure an advocate was present. Within days Valarie received a phone call from the care facility that was watching him. He had been left alone in a room and when the caregiver returned he was unresponsive and not breathing well. They called 911 and sent Justin to the nearest hospital. It was Fred’s hospital. Valerie immediately called her husband at work and told him to drop everything and drive to the hospital. When he arrived, Justin was still unable to breath well and his pulsox was very low. A nurse was standing in the hall way and two Doctors were conferring about the case. Justin’s father asked them, “What was wrong?” The doctors told him that they were thinking of sending him down to x-ray to check for an obstruction. The Father asked, “ Have you looked in his throat? Then Justin’s Dad strode over to the gurney and forced open Justin’s mouth. He reached into Justin’s throat and pulled out a therapy glove. The doctors chuckled and one said, “I guess you did our job for us.” Soon Justin’s Father arranged transfer to another hospital for Justin’s recovery from oxygen deprivation and an infection stemming from the lodged glove. I often speak at medical conferences and attendees ask me, “Do you think sharing Fred’s story can save lives?” I say, “Yes, I do. I already know of one life saved.” But I was only there for Valerie one time. Valerie has saved Justin’s life time and time again. She is a chronic caregiver to a very compromised patient. She is playing a game of Hospital Land that has lasted 25 years. Often she does her work with the name tag "Guest," emblazoned on her chest. Her title should be caregiver- not guest, she should be considered a valuable part of the medical team. 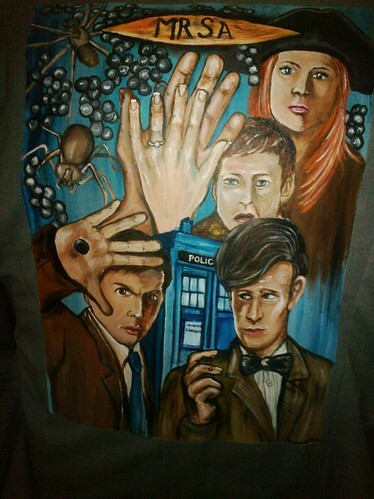 I am glad I was able to paint this jacket for Valerie. I am glad for all the jackets that have been arriving from all around the country. 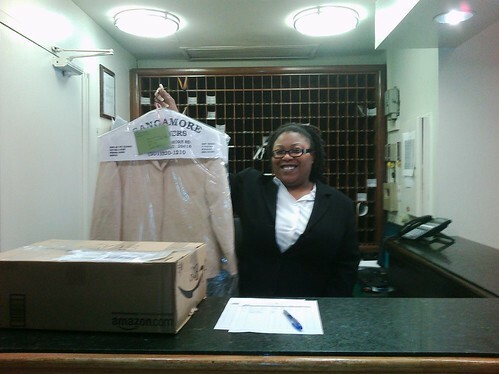 I am glad to daily talk to the folks at the front desk as I pick up all my packages. It reminds me of another time, when I would come home tired and pick up the meals provided by kind neighbors and talk to the caring folks at the front desk. 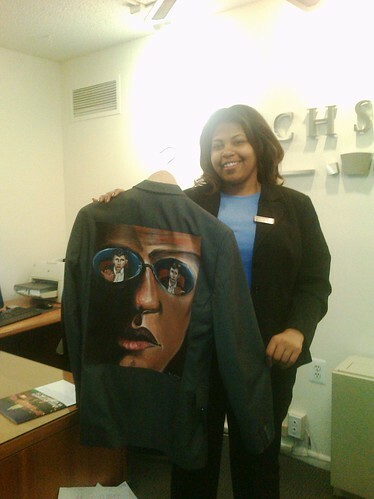 Thank you to all the front desk staff for helping make the Walking Gallery possible. Thank you Valerie for joining your walk with mine. On December 11th 2009, I wrote Medicine in the Matrix. 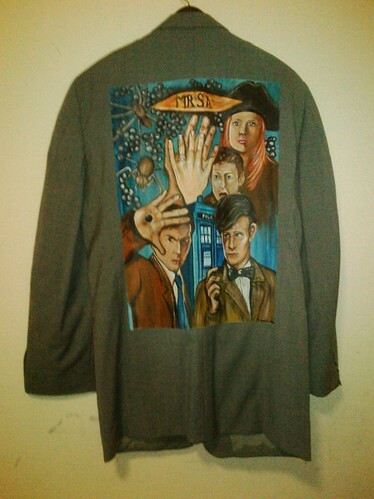 It was a post about the first Advocacy Jacket that I painted for Jen McCabe. That jacket was called Data Prison. 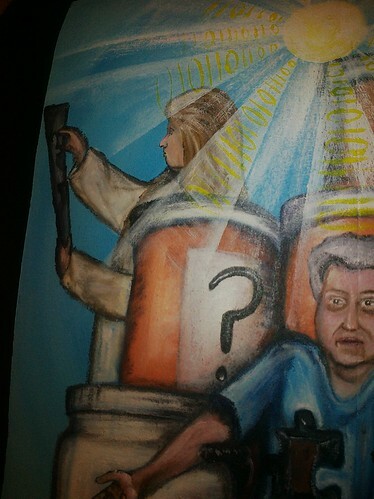 In that painting a patient stands handcuffed within a data stream. In that post, I mentioned red pills and blue pills and the NIH Pillbox project. A little over one month later on January 15th 2010 I would present an Ignite speech at Social Justice Camp DC. I would meet so many wonderful people that night: great advocates like Kelli Shewmaker, Aaron Ginoza, Ben Merrion and … David Hale. I had heard of David Hale and knew he had something to do with Pillbox and advocacy, but that night I met a man with a vibrant personality who could talk medicine as well as he could talk poetry. On May 21st 2011, David came by to drop off his jacket just as Ben Merrion came over to take Isaac and I to a concert at UDC. We joked about how we keep running into each other, was it just a coincidence or were we seeing a glitch in the Matrix? 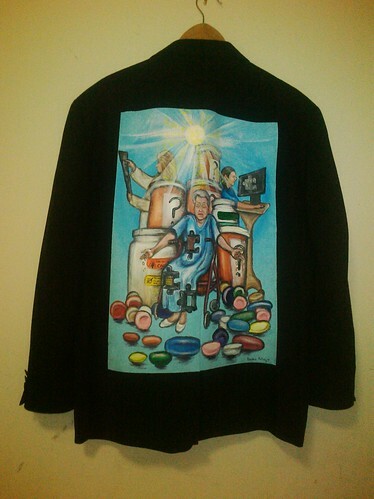 This is David’s jacket: Medicine in the Matrix. In this frame Morpheus has given his ultimatum, “This is your last chance. After this, there is no turning back. 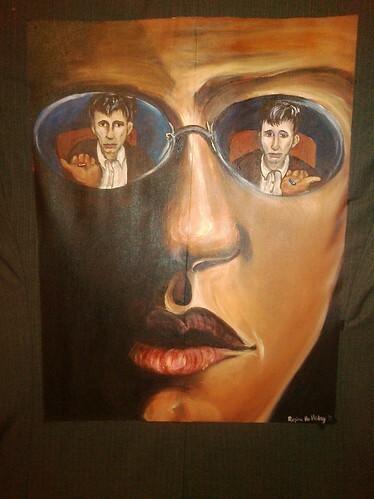 You take the blue pill -- the story ends, you wake up in your bed and believe whatever you want to believe. 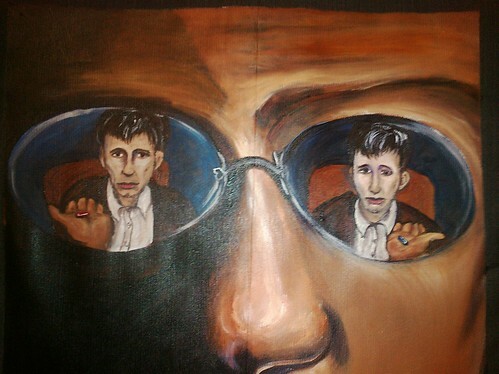 You take the red pill -- you stay in Wonderland and I show you how deep the rabbit-hole goes." But in this image Neo has been replaced with David Hale. He stares with acceptance at the red pill, knowing he will eat it. He knows that know matter how hard the path is to walk, it is more important to know the truth. He knows this in his work and he knows it within every quantified cell of his body. But, oh the temptation of the blue pill! It would be so easy to give up the fight. To be a regular working Joe, who punches the clock and does not spend weekends and evenings at medical conferences expounding on the importance of open data and information access. His face is filled with longing for that simpler yet dangerous path. I am glad that David is one of us. The red pills. The ones who walk the hard path, the path down the rabbit hole that leads to a Walking Gallery. Recently while talking to Ted Smith about The Walking Gallery and his jacket, I began thinking about mothers and jigsaw puzzles. I met Ted Smith officially on Facebook on September 6th, 2010. 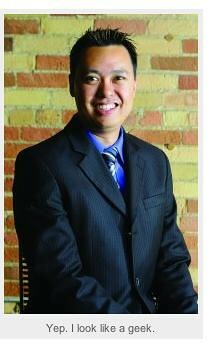 Ted is Sr. Advisor, Innovations and Technology Transfer, ONC at U.S. DEPARTMENT OF HEALTH & HUMAN SERVICES. In the fall, we were both asked to participate as judges of the Health 2.0 Developer Challenge using Community Health Data. He reached out to me and asked to be my “friend.” We spoke in person at the IFHC Patient-Centric Roundtable, on March 4, 2011. He seemed kind and rather quiet in room filled with the large voices of the likes of e-Patient Dave, Ted Eytan and Alex Drane. 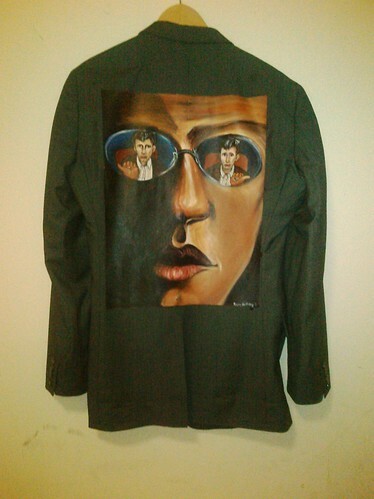 He stayed in touch with me in the months hence and I asked him to join The Walking Gallery. Ted’s Mother, Grandma Smith, sits in the center of the frame. Her face stares out at the viewer with the frank appraisal of those who are about to die. 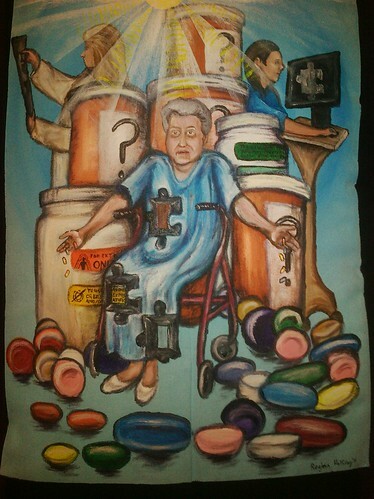 “Why?” She asks us as multiple pills drop from her hands. Her hospital gown covers her nakedness, whilst large chunks of her body have been removed. The holes that are left behind form the shape of a jigsaw puzzle pieces. On either side of the frame two medical professional view the X-Rays of Grandma Smith. 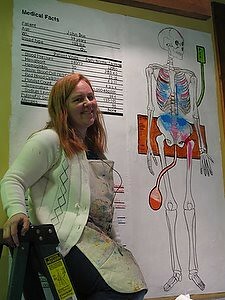 Our left side doctor holds her x-ray to the light and decides with that piece alone she will prescribe a certain medicine. 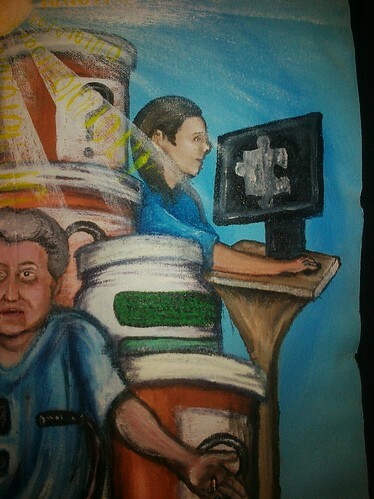 On the right side of the painting another Doctor views another puzzle piece upon a computer screen. She, too in turn, will prescribe another drug to solve the problems of this symptom. Neither Doctor will put the pieces together to treat the whole wonderful person that is Grandma Smith. She would have no reconciled view of her past or current treatments and the cycle of side effects and symptoms would be larger than any doctor appeared capable of reconciling. The drugs become a towering landscape that dwarfs the patient in its midst. Label upon label is affixed upon jar upon jar of medicine. All the while, the patient wonders why. Alone and afraid, she sits besieged as the pills encroach. So she suffers unnecessarily and expensively from the side effects of the treatment of a narrow range of disorders, all the while a rare and aggressive cancer was attacking her from within. 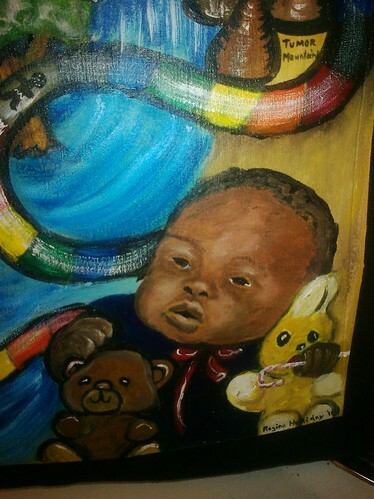 But there is hope within the painting, the beams of the sun pour down upon the terrifying image. Those beams are made of the 1’s 0’s of binary code. This is the data cloud that can save us. This is all that is simple and transparent. This is Ted’s hope for us. Ted hopes for a time when someone else’s mother’s full treatment can be viewed in one place. He envisions a future where a computer can deal with the simple stuff, i.e. drug interactions, and Doctors dealing with the harder stuff. He sees a future where a person’s entire medical history is only a mouse click away; a future where the lack of one data set is considered just as tragic as my mother’s lost puzzle piece. The other day I got a call from Cindy Throop. 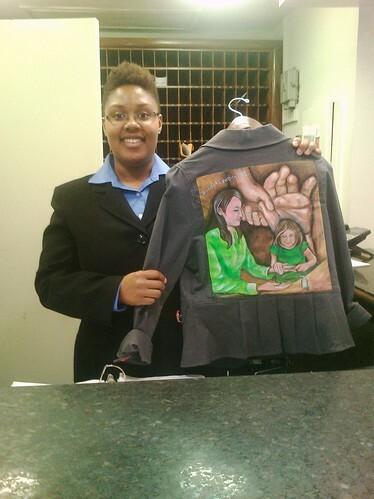 She had decided on the patient story for her jacket. She was coming out of the closet about suffering from depression. For 20 years she has suffered from the effects of depression, and now she has decided to let others know. Mental illness is still a no man’s land for many of us advocates. Oh, you can talk about cancer and dying. You can even talk about unhygienic beside tray tables. But there is a feeling of “Shh, we don’t talk about mental health. It is verboten.” What if we lost our job? What if we could never get health insurance because we admitted to depression? I once went without health insurance for three years, because I was too scared to admit I had been depressed. In 1993, I was 21 years old and in Navy technical school. I was suffering from situational depression. It was really bad. I missed Fred and my family. I was bunking alone in a strange city. I knew almost no one in Chicago. I was spiraling into sadness. 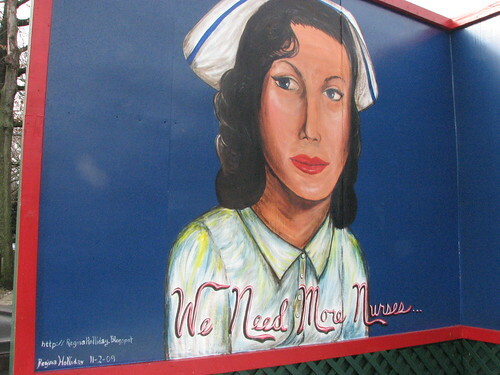 During this dark time, I was admitted into the Naval hospital for psychiatric treatment. I didn’t take drugs for depression. I just talked with the counselors, and I drew. I find art to be an amazing form of medication. I began a very large pencil drawing. The staff said it was a nice picture, but why the really big empty space? I explained that it was my life story, and my life was far from over. I think that was the right answer, because I was soon released. I met Cindy a little less than two years ago. She is part of my health 2.0 Ka-tet. I met her at the same meeting at which I was introduced to Ted Eytan and Susannah Fox. We hit it off almost immediately since we had so many things in common. She is now one of the emergency contact people for my children, and she created my advocacy time line on open health. She is funny and kind and often brings a little stuffed animal to events called Throop Cat. 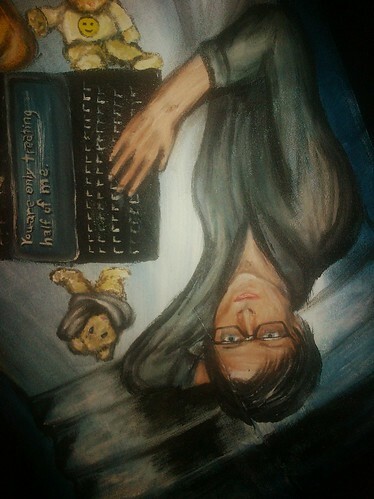 In this painting there are two Cindy’s. They are framed within the shape of an unlit bulb. 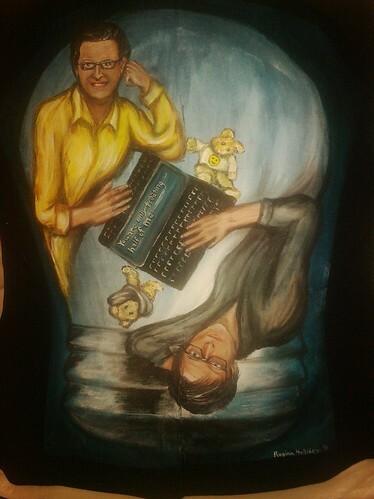 The Cindy in yellow is happy and joyous beside her is a Throop cat dressed in a small shirt with a happy face upon it. Below this Cindy is another dressed in gray. This Cindy is stern and sad. She types upon a laptop the words “You are only treating half of me.” Beside her is Throop Cat again --but this time in a straitjacket. You see, those of us who follow Health Information technology and Meaningful Use are concerned about information access related to mental health. I first heard speeches about this issue almost two years ago at my first Alliance for Health Reform meeting. The Alliance for Health Reform is a nonpartisan, nonprofit group; it doesn’t lobby or take positions on legislation. But it does create excellent panels of speakers discussing very important topics within healthcare. (They also provide box lunches.) I registered for the event Healing Mind and Body: Behavioral Health and Reform on Friday, July 17, 12:15 PM to 2:00 at The Columbus Club, Union Station. The focus of talk wandered into a topic area I was very interested in EMR (Electronic Medical Record) access. And unlike many of the groups I listen to, this room was deeply fractured on patient access. We were talking about record access within the world of mental health. And in this venue, even having a medical doctor access the same EMR as the mental health provider was controversial; forget about letting the patient have access to the information. I stood up to ask a question in the Q&A session at the end. I asked about my husband's case. Could Fred have lived if our system was designed to treat the mind and the body? Would he still be alive today if psychiatrists required full physicals and accessed that information? Would he still be playing with his sons if he had been treated as a whole patient? 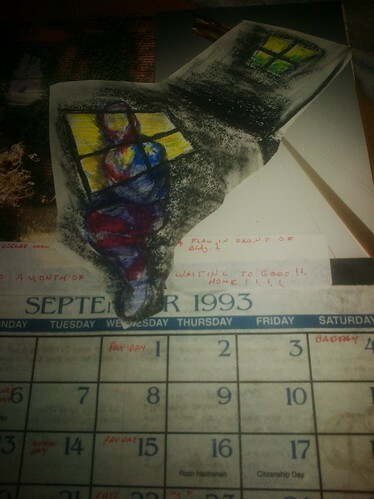 In the spring of 2008, Fred and I saw a psychiatrist every week from late January until May. Fred had been very depressed, fatigued and was losing weight. Our son had just been diagnosed with Autism, and he had taken that rather hard. Fred was also very sad that although he had been an adjunct for years, he could not find a full time job. The psychiatrist was an incredibly nice man who saw us even though Fred did not have insurance and we would have to pay out of pocket. We talked through our problems, and it seemed to help Fred’s emotional state. That summer Fred was hired at American, and that helped raise his spirits considerably. I was frustrated such a question was asked in such a way so late in the game. My dismay continued in hospital after hospital setting. 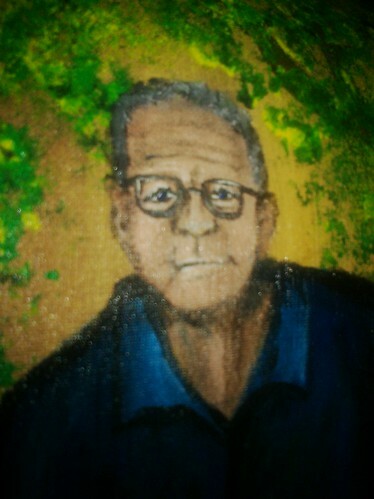 Fred’s condition worsened, and pain both physical and emotional was treated by another drug, but rarely counseling and the arts. I am very glad that Cindy is coming forward to walk in the Gallery and spread awareness about living with depression. Perhaps her efforts will save a few Freds or help a few Reginas feel free to claim the insurance or type of treatment they need, and finally, we can be treated as "whole" people. 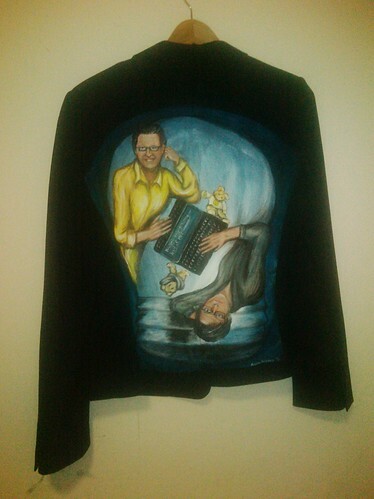 This jacket belongs to Carolyn Capern. Carolyn was one of Fred’s students at American University in the fall of 2008. I heard about her talent and ability from my husband long before I ever met her. In the spring of 2009, Carolyn became one of my Facebook friends. She followed the odyssey of Fred’s often botched and fractured care in real time. She wrote about our story and advocacy in Carolyn's Thoughts: Health and the Hollidays on August 14, 2009. 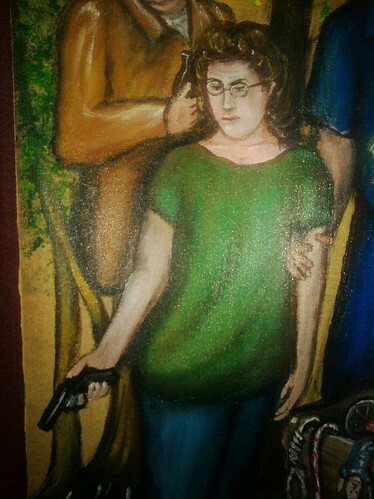 She was there the night we dedicated the mural and sang songs from Buffy the Vampire Slayer. She presented at the Social Justice Camp DC event in January 2011 and spoke about social justice at AU using multiple images from the media. 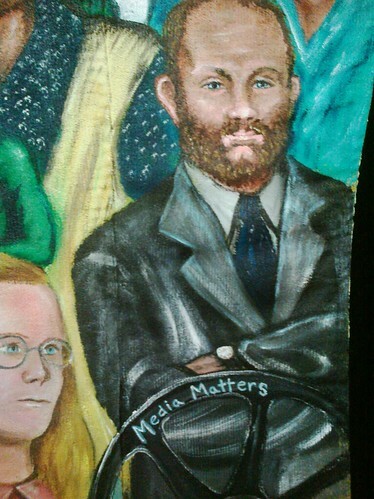 When I began design Carolyn’s jacket, I was very inspired by the lessons Fred taught us both: Media Matters. Media can provide the bridging conversation that can create great sense empathy among all participants in the conversation. Media can give you chance to communicate your ideas to a larger world. Media access can help alleviate pain even if you are Watching THE DAILY SHOW while Dying. 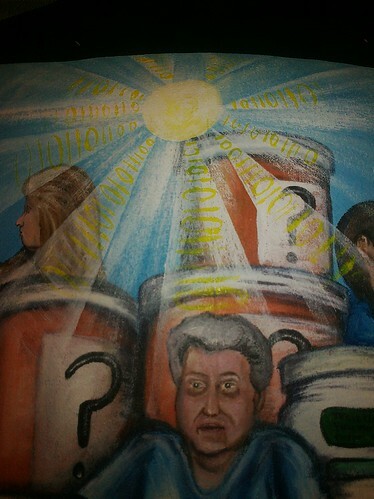 While I was painting, I thought of a specific conversation I had with the IHI fellows. On March 10, 2011, I was in Green Bay Wisconsin learning about the amazing patient care activities at Bellin Health. I spent the day being shuttled from one care venue to the next. That evening I had the pleasure of going to dinner with several folks from Bellin and the IHI fellows. I was so happy to speak with them. I met John Kruger, MD, employed by the Native American Medical System in the Southwest. I also met Malcolm Daniel, IHI Fellow and Patient Safety Advocate from Scotland, and Lesley Anne Smith, the Head of Clinical Governance and Risk Management at NHS Highland, UK. And partially due to my presence at the table, we talked about 1970’s family television programs in the US and how they relate to medicine. You see many years ago, my husband Fred taught me a very valuable lesson in dinner conversation. You can always lead a conversation in a new direction if you begin talking about television or movies. Fred did this all the time, as he was very interested in media and how it affected our world. It was really fun to talk of shared experiences through the episodes of years gone by and how each narrative arch captured the zeitgeist of the times. He also did this while teaching class, which made some students consider him “prone to go off topic” and cause other students to love him. 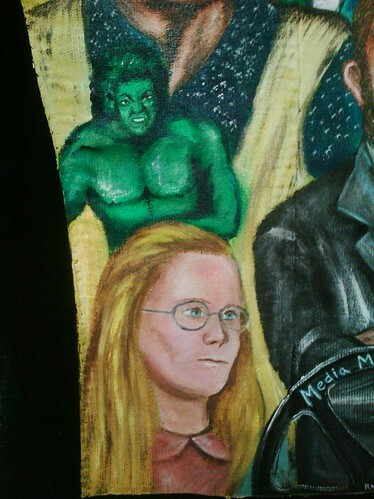 That night, I spoke about The Incredible Hulk TV series as it depicted the depths of sorrow and grief upon losing a spouse, as well as depicting concerns about accidental overdosing in radiation. I bemoaned the quality of current "children's programs." They seem to expect too little of children. 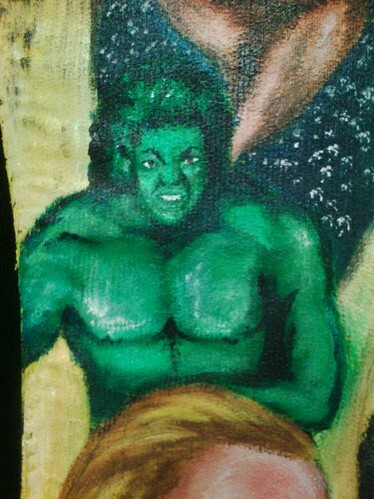 I started watching The Incredible Hulk at the age of five. I loved the show. It conquered topic after harsh topic. I was only 7 years old when the episode "Metamorphosis" aired. In less than one hour, the show addressed anger issues, classism, drug abuse and passive suicide. It promoted altruism and the concept of embracing your calling in life, regardless of whether it is as economically advantageous. The topic then moved to Little House on the Prairie, and we spoke of the episode where Caroline has an infected cut that she must clean before it is too late. I also brought up my own personal experience of being empowered by Mary Ingalls portrayal of a child needing glasses. So empowered, that I managed to convince my mother of my need for an eye exam. And I rejoiced in the improved vision with my New Eyes. I went on to mention the episode where Mary loses her baby due to a fire. Mary then goes through a period of deep denial and before collapsing into a catatonic type of grief. We talked about the important role Jack Klugman, star of Quincy, ME, played in television and in Congress. He and his show, with its depiction of patients who have rare diseases but could not access needed medication in the United States, helped to pass the Orphan Drug Act. We touched briefly on Fred’s favorite character: Hawkeye Pierce on M.A.S.H. That show’s brave decision to dedicate the majority of its final episode “Goodbye, Farewell and Amen.” to Hawkeye’s nervous breakdown and hospitalization for mental treatment, helped promote a greater awareness of the effects mental illness and depression and showcased a potential road to recovery. This episode aired in 1983 and was the most watched television broadcast in the history of American television until 2010. I was only 11 years old at the time that it aired, but I vividly remember sometimes a "chicken" is not a chicken. Sometimes the choices we make in life lead to someone else’s death. Finally, we discussed the character of Grandma Walton from The Waltons. To me Grandma Walton is the face of a stroke. I was only six years old when Grandma Walton came back on the show after Ellen Corby, the actress playing the role, suffered her stroke in 1977. I remember the shock of seeing her face and words twisted, but I also remember how glad I was to see her back. This was 1978 years before ADA legislation; it was not common to see people with disability or illness on TV. I was only six, but I was proud of Grandma Walton. I was proud of what she stood for. I took her bravery in appearing very personally. You see my mother had an episode of Bell’s palsy during that past year. My mother no longer smiled. Half of her face was slack and she wore bandage over one eye to keep it moist. But each day she would go out and live her life just like Grandma Walton. It was a winding conversation that night, but it came down to the power of the media to tell the story of Medicine. And the televised story of a stroke brought us back to Bellin Health and Betty Bundy and The Power of Naming Names. Which brings us back to another thing Fred liked to say, “It’s about the story stupid.” Why does Dennis Quaid have the power to help change the way we identify medicine? How has Michael J. Fox and his foundation raised so much money in so little time to fund Parkinson’s research? We fell in love with their characters. We let the fictional realities they depicted be projected onto the flickering screen within our heart. So when tragedy struck, we took it personally. When we watch the shows that define our lives, they teach us lessons. They give us parables. They show us when to pull a “Shirley Maclaine” and when it is time for The Last Puppet Show. 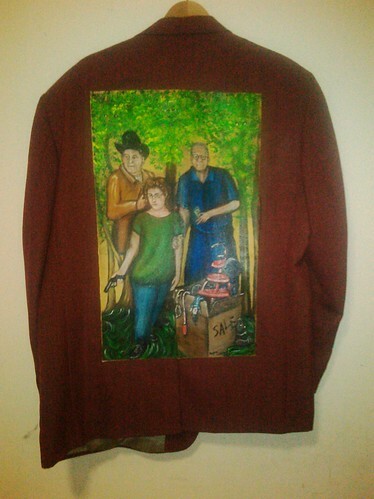 In close, thank you, Carolyn, for wearing this jacket. Fred would be so proud. Each day you walk the earth and spread his message about the importance of media, you create a living tribute to his memory and inform others about the power of the story. 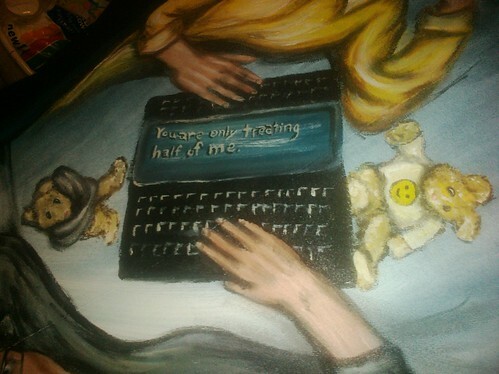 That is exactly why we walk within The Walking Gallery. Three weeks later on the day we left the hospital, Dr. Mango came to see us. He told me the transfer didn’t make sense. We weren’t going to a higher quality hospital. We were making a “lateral transfer.” I said it did make sense, if you were trying to get a second opinion. Dr. Mango then shook his head sadly and then went to sit with Fred. His shift was over and they talked of their children and of books they had read. Dr. Mango promised to visit Fred and said someday we would have a picnic with all of our children in a park. And then he left. Weeks later, when I sat at Fred’s side in hospice, he turned to me and said, “Dr. Mango lied. He never came to visit. There will be no picnic.” No, often life is not a picnic. And I could not help but think Dr. Mango has not had the kind of life experiences I have had. He has not suffered through the kind of events that teach you to be true and brave and courageous. No matter how small or disempowered you are. When I was in fourth grade, my father killed a man. He got into a late night knife fight in the parking lot of the Sapulpa flea market. Tendons were severed in his hand and his gut was ripped open, but he won the fight. He drove himself to Bartlett Hospital, and as he was somewhat delirious with blood loss, he entered through the employee entrance. This wasn’t actually too odd, as my mother worked there as a housekeeper. He was used to this door. He left a blood trail all the way to admissions, whereupon reaching triage they decided to life flight him to St. John’s Hospital in Tulsa. The next morning was Easter Sunday. My mother went to work and mopped up a corridor filled with blood, not knowing it was her own husband’s. While she was doing that task, I was hiding Easter eggs in the back yard. The phone rang, and my grandfather bade me to answer it. I did and it was Virginia Beaverson, the nice lady who ran the flea market. She said, “Honey, I got some bad news. Is your momma there?” I told her no, and she proceeded to tell me that there and been a knife fight overnight and that my Father was badly injured and the other man was dead. I hung up the phone and told my older brother and little sister. And we waited. Over the next few days my father had multiple surgeries to save his life. The teachers in school told my sister and I that they were praying that he would make a fast recovery. But my sister and I could not do the same. Dad had been abusing us for years. So even though we loved God and wished to do his will, we could not pray that Dad would have a fast recovery. Our father eventually recovered and went to jail for several months. I must say those were some of the best days of my childhood. He was tried and convicted of manslaughter, which is a felony. He could no longer vote, be part of a jury … or buy a gun. Which is why I shot and purchased a gun at the age of twelve. 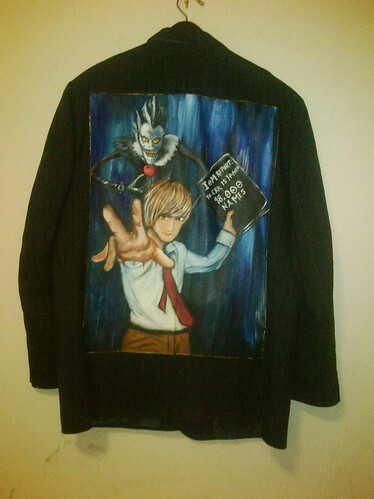 This is Ladd Everitt’s jacket for The Walking Gallery. 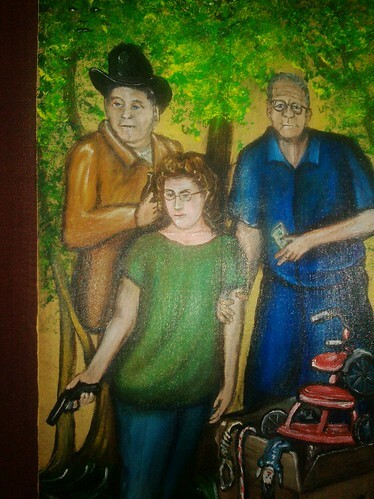 It is entitled The Gun. Ladd Everitt is the Director of Communications of the Coalition to Stop Gun Violence. In this position, he is responsible for developing and managing a wide range of communications activities in support of the organization’s overall mission. Ladd also serves in a volunteer capacity with the D.C. Crisis Response Team, a group that offers comfort, support and referral services to victims and survivors of homicide in the District of Columbia. Ladd relocated to the District of Columbia from New York in September of 1993 to pursue a Masters degree in U.S. Foreign Policy at American University. And that is how I met Ladd way back in 1994 as a friend of Fred’s. He was fun and boisterous and generally a great guy. We lost touch with him over the years. Then Facebook brought us back together, just as Fred was becoming ill. Ladd had remained my friend in the ensuing months after Fred’s death. As I became more deeply invested in social justice, patient activism and public health, I became very interested in the work Ladd was doing in DC to stem gun violence. I invited him to speak at Social Justice Camp in January; he presented a stirring speech on the subject. I asked him to participate in The Walking Gallery and told him I had a story to share. When I was twelve, I was working in the flea market stall, when my father came over with a man in a hat. They told me to step into the woods with them away from the traffic of the booth. I was very frightened. No good can come from stepping into the woods. My father said, “This man here is looking to sell a gun, and seeing how I am a felon, I can’t buy it. But you can.” I looked into my Father’s eyes and saw little crinkles of anger at the edges. Now, I remember many things within my life with Kodak clarity. The bowl of yellow cornflakes I ate with my grandfather when I was not quite two years old. I still see within my mind the lovely red yarn that was tied to a present from Aunt Mabel when I was but five. And I can close my eyes and see the graphite sheen of gun metal, as I pulled the trigger and shot the earth. The gun worked. My Father handed me the wad of bills and I bought a gun. For the next five years, my dad would threaten to kill us with the gun I bought. Each year he would sink deeper into alcoholism and violence. By the time I was 17, I was certain he planned to kill us all. 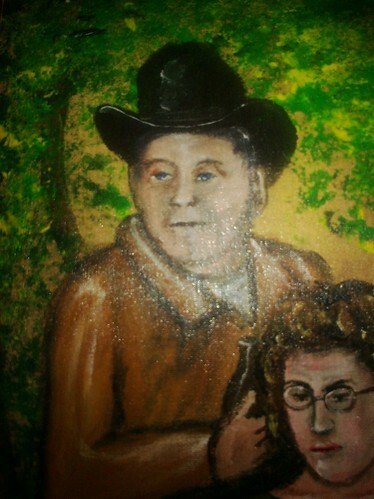 That night he sat at the kitchen table drinking, and spinning the gun in lazy circles on the melamine tabletop. 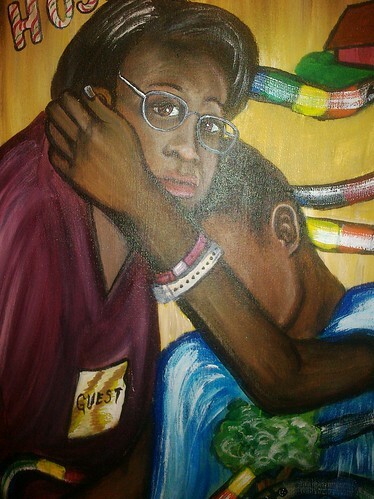 My mother washed the dishes at the sink with silent tears running down her cheeks. My 15-year-old sister tried to study, and I went back and forth doing the laundry. He finally passed out close ten pm. It was enough. My little sister and I were going to run away. 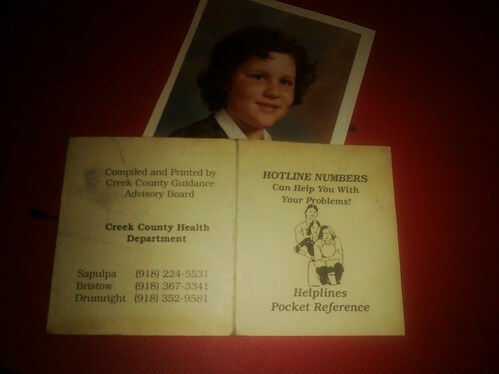 I called a crisis hotline number from Katie and Angie Berg's house. Katie and Angie had been my best friends in childhood. And from their house, I called a number I had saved since fourth grade, just in case things ever got so bad that we must escape. We were told to go to a local youth shelter. Our friend and fellow student, Robb Fulks, drove us to there. We spent a couple weeks there, and our mother had to choose between her daughters and her husband. She chose us, and dad had to leave the house. And everybody lived. We spent the last two years of our youth in a home without the constant threat of violence. Dad realized he needed to get in control of his alcoholism, and lived for ten more years. Now, some folks might think this story has nothing to do with health, but it very much does. There are the obvious negative emotional effects of living in constant fear and the physical marks from whips and beatings. There is the public health concern that the 12-year-old daughter of a felon could buy a gun. But most of all, when Fred was sick, the oncologist in charge of Fred’s case was as horrible to deal with as my father. I did not escape one tyrant so many years ago to watch another let my husband die. I was forced once again into the role of a victim. We should not “complain” as it would only make it worse. We should wait in silence for a treatment that never comes. And only when the realization came, that death was truly eminent, when the gun began to spin, was I released from silence to secure our escape. If I could leave one thought with you it would be this: there are patients and families throughout the country suffering in silence, and their suffering feels exactly the same as that of an abused child with a gun to her head. A few weeks ago I began following Colin Hung on twitter. He is really cool, and following him was a no-brainer as his avatar is a little guy holding a lightsaber and he tweets about health care social media. It got even better. He liked Doctor Who. He even managed to tweet a Doctor Who in-joke into a social medial chat two weeks ago. I had to invite him to join the Walking Gallery. There is only one problem: he lives in Toronto. This is the Colin that most other people know. And I have been explaining to Colin the amazing ways Doctor Who and heath care intersect. 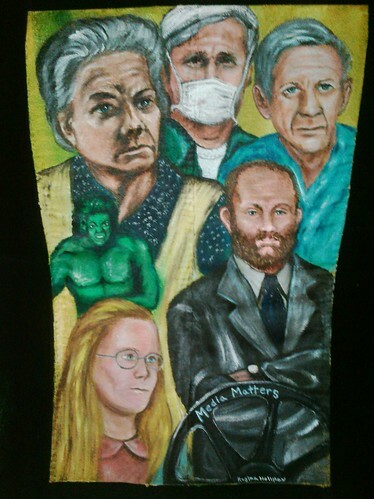 In the fall of 2008, long before I began my journey of medical advocacy I would spend each morning researching the Doctor. I would type in "Doctor Who" and skip over malpractice suits and break-through drugs and go right to the newest blog or entry on the BBC’s Doctor Who. He is a fictional alien and time-lord who is around 900 years old. The show is the longest running sci-fi show in the history of television, and after a hiatus in the 90’s, it was re-booted in 2005. In the original series the Doctor was always very much in charge and his mostly female assistants or companions existed to further the plot. In the 2005 re-boot, companions became an equal partner in the Doctor/companion relationship. It was a great show. Our whole family fell in love with it. Our eldest son Freddie decided to make his 10 year-old birthday party a Doctor Who carnival. He invited 70 of his friends. And he invited his very best friend, and that child made it to the party very late. But he came very close to not making it to the party at all. He came very close to not making it to anything ever again. A week before the party Freddie’s friend had a small cut on his leg. At first it just seemed inflamed. But as the week progressed, the spot became darker and deeper. By mid-week, the child was running a 104-degree temperature in the middle of the night. Although his mother had two other small ones at home, she roused the family in the middle of the night. She took her son to the ER, where the doctors told her the infection was quite serious. It was good that she had not waited till morning, because the child was infected with MRSA bacteria. MRSA is Methicillin-resistant Staphylococcus aureus; and Freddie’s friend had most likely had the community-acquired MRSA (CA-MRSA). The staff of the hospital ran two courses of very powerful antibiotics into his body. It was touch and go for a few days, but by the end of the week he was discharged from the hospital and was able to attend the very end of Freddie’s Doctor Who birthday party carnival. Last week, Doctor Who aired its third episode in series 6. It has been a great season so far, and the American viewing audience has been fully embraced. The show now airs at the same time in America as it does in the UK, and the first episode was even partially filmed in America. I wondered if they warned the cast and crew of the hazards, other than snakes, in the American west. I wondered if they had been warned about the brown recluse or “fiddle-back” as it is known in Oklahoma. I wonder if they know how a really small bite can lead to a really big hole in your body. 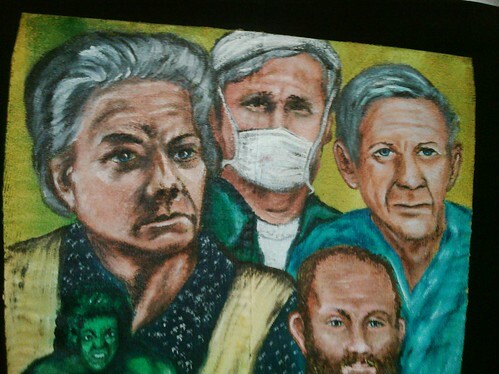 In this painting, there is a close up of the MRSA bacteria surrounding the familiar characters. Each bacterium at a cellular level appears as a series of black spots. There are also two brown recluse spiders, as initially a bite from one of these spiders looks like a case of a MRSA infection. 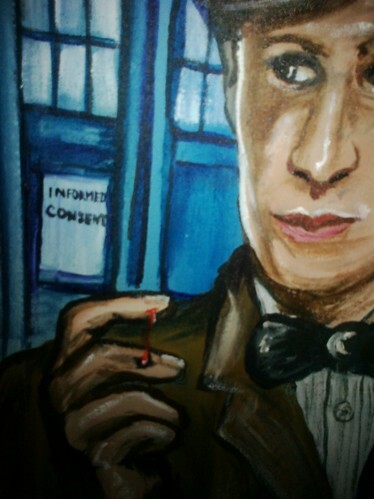 I also inserted the Tenth Doctor, David Tenant, with a black Spot, beside Eleventh Doctor Matt Smith with his “small” cut. “The Siren would then appear and lull her victims to touch her, which would apparently disintegrate them. Rory Williams (Arthur Darvill) receives a cut during a tussle with the pirates and, knowing the Siren is using water as a portal, the Doctor (Matt Smith) instructs everyone to seek refuge in the ship's dry magazine. There, they find Toby Avery (Oscar Lloyd), the son of the ship's captain Henry Avery (Hugh Bonneville), who stowed away on the ship after his mother died to work with him, unaware of his father's illicit deeds. He too has a black spot on his palm due to a fever. In an attempt to evacuate the crew, the Doctor and Avery board the TARDIS, but find it is acting haphazardly, and are forced to evacuate before it dematerializes by itself. 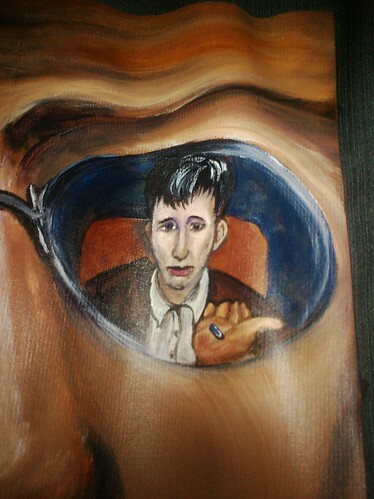 After the Siren in a dry room takes another shipmate, the Doctor realizes the Siren is actually using reflection to appear. In response they rid the ship of any reflective surfaces, including the ship's stolen treasure. When a storm begins, those who remain on the ship start to set sail. Toby drops a polished crown while bringing his father a coat; the Siren is summoned and takes Toby. Soon, Rory falls into the ocean, the siren takes Rory and the Doctor believing the victims are not dead, convinces Avery and Amy Pond (Karen Gillan) to prick themselves. The Doctor's suspicions are confirmed when her touch actually teleports them to an alien spaceship, invisible in the same spot the pirate ship is located. To symbolize this concept, the TARDIS, a Police Box, has a small informed consent form affixed to its front panel. 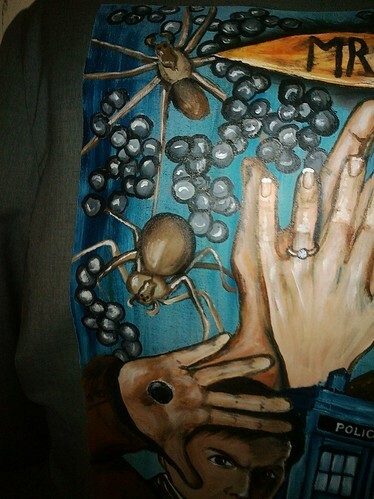 This and the hands clasped above it wearing wedding rings are referring to the moment in the episode when Amy is allowed to touch Rory after proving to the siren programme that she is his wife. The image of Rory and Amy are repeated with a shocked gaze; they cannot believe that they will have to save themselves. There was quite a bit of backlash online about this episode. After all, how could a cut kill you? Why would the Doctor just stand aside and let the novice Amy resuscitate her unconscious husband? Why perform tracheotomies on people who are barely ill? 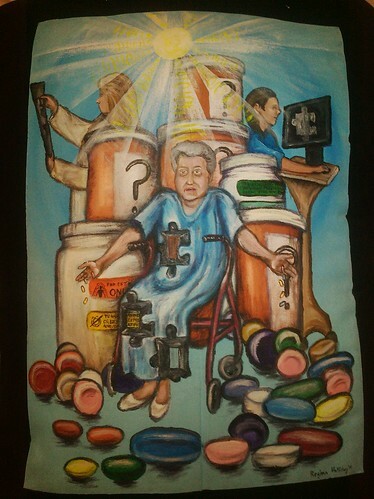 It all makes sense if you view it through viewing glass of the e-patient movement as a commentary on modern medicine. 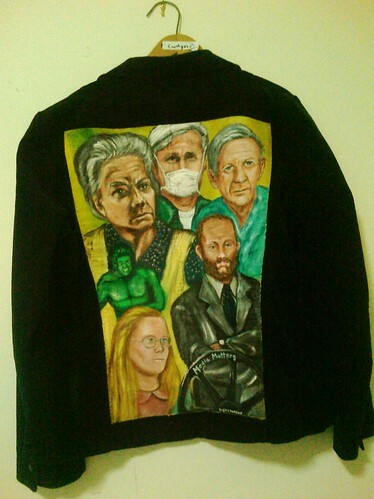 I decided I must do a painting about this episode for the Walking Gallery and I knew the perfect person to wear that jacket: Colin Hung. And here it is. Colin can’t fly into DC for the day, so my friend Will Kemp will wear it that night. But I look forward to the day Colin wears it in Toronto. 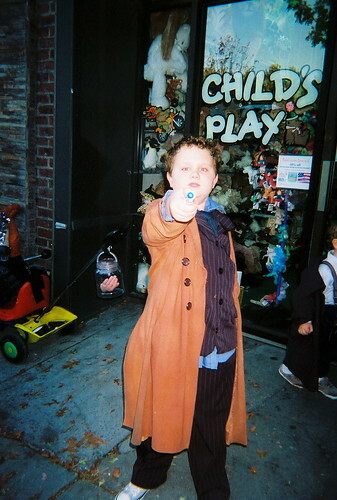 He will spread interest about Walking Galleries, health care, and of course, Doctor Who.